In partnership with local (mega successful) hair company, Virtue Labs, attendees were able to receive mini facials/make up touchups, as well as hair consultations. Considering that I had just left an intense HIIT workout class, I needed ALL the things! 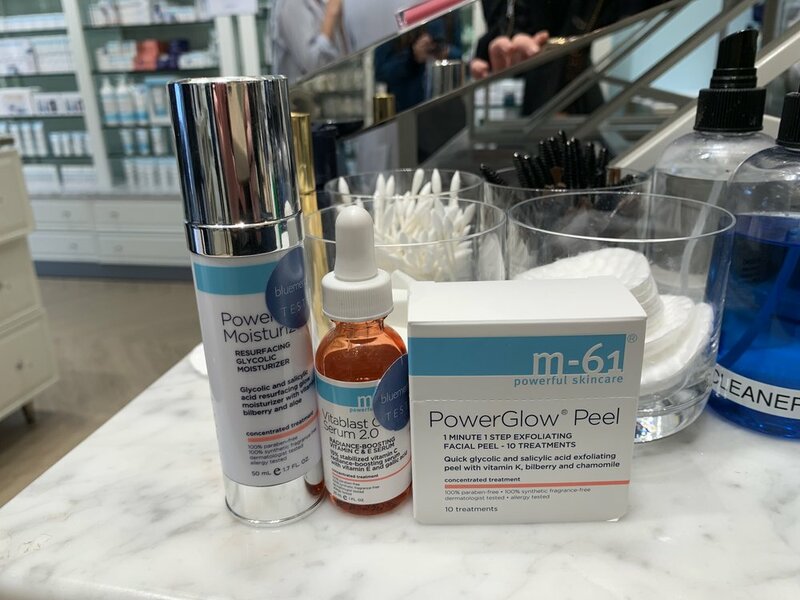 After sharing with Nicole (the Beauty Expert who was helping me) my skin worries, we picked out the perfect treatment. 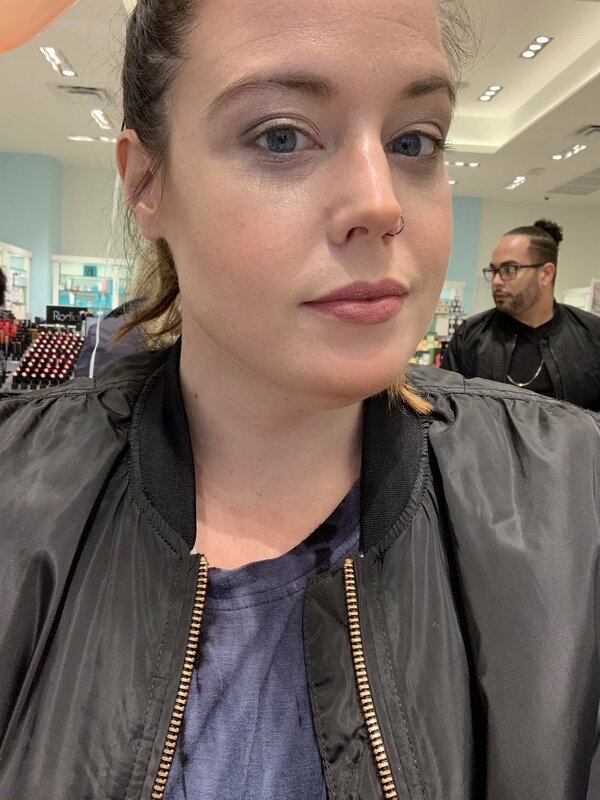 Nicole suggested that I try Bluemercury’s in house brand m-61. Once my face was squeaky clean, Nicole and I went over what makeup style I normally go for. I LOVED this as I am super picky and find that some makeup artists do what they think is best for your skin, rather than what you generally prefer. After going over what I generally like for my makeup look, Nicole choose to use the lune+aster line. This line was perfect for me on my “clean beauty” journey as they are vegan, paraben-free formulas. After this amaze mini-makeover, it was time to get down and dirty with Virtue, a brand I have wanting to try for years! Local stylist and Virtue super fan, Dustin, gave me the rundown on the brand and before even trying it, I was hooked! We talked about my hair concerns, I apologized about how gross my hair was, and then we were off to style me into the full glitz diva that I truly am! Virtue uses Alpha Keratin 60ku® technology which totally sets them apart! Six years ago, a group of bio-scientists had found an entirely new way to collect Keratin in its pure form. This incredible protein is what makes up 90% of our hair, skin, and nails. This discovery was Alpha Keratin 60ku®. This magical treatment boasts 67% reduction in frizz, 95% split end reparation, 22% increase in thickness, and 138% increase in color vibrancy. Have I sold you yet?! Dustin and the amazing Virtue products were able to transform my gross post-workout hair into a beautiful curly creation with tons of volume. 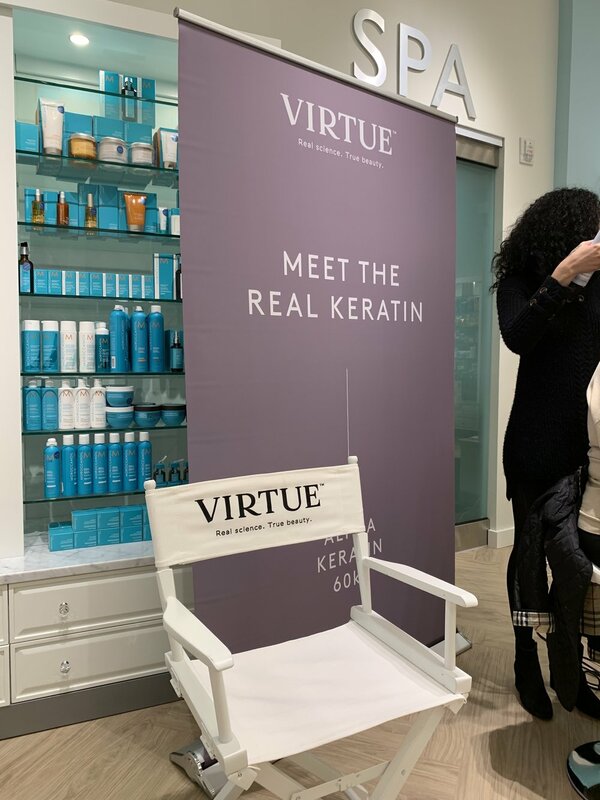 Needless to say, I was MORE than sold on the Virtue products and left with a bag full of their products as well as a ton of amazing samples from the various Bluemercury brands. I had an amazing time in the store getting fancy. The entire staff and their guest stylists were so helpful, kind, and knowledgeable. I cannot recommend Bluemercury and their team enough!! I am counting down the days until my next visit to explore their others brands! Bluemercury also offers spa services like facials, massage, and waxing as well as makeup application. They even offer a Renewal package that includes a facial, brow styling, and makeup application for only $155 which is an absolutely deal! Are you a fan of Bluemercury? Let me know your favorite brands in the comments!